If you’re looking for the perfect 5000 lb floor scale package, FloorScalesDirect.com has you covered. 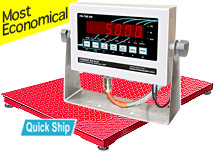 Our 4x6 5000 lb industrial floor scales come complete with self-leveling weighing deck, LED or LCD digital indicator, and the cables and cords you need to set up the industrial weighing scale system. Your weigh system can run indoors or outdoors and is factory calibrated for ease of use and providing the highest accuracy readings. 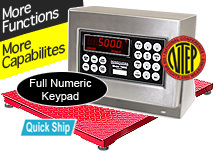 Weigh warehouse shipping and receiving items, containers, pallets and skids, gaylords, and drums, while being assured that our built-in overload protection will protect your investment. 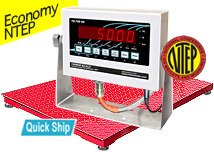 Our industrial weighing scale packages ship ready to connect and use. We offer free shipping through most of the U.S. and our “Quick Ship” option gets your package shipped by the next business day. If you have any questions about our items, call us at (800) 238-0142 or e-mail us at info@floorscalesdirect.com. 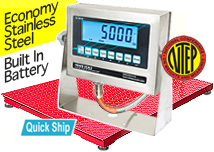 Check out our 4x6 5000 lb industrial floor scales packages from FloorScalesDirect.com now.